Antique Pews and Benches | Browns Antiques Billiards and Interiors. 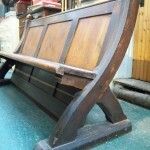 We stock a range of antique pews and benches. Antique pews are available in various sizes. Please browse pews and benches in stock or contact us with the size you require.